In the last weeks, I worked on two new features for Karrot: store walls and subscriptions. They are currently available for testing on https://dev.karrot.world and we plan to release them to karrot.world next week. You can use the store wall to discuss topics per store (instead of writing on the group wall). Vice versa, with store subscriptions every group member can decide which store they want to mark as their favorite, thereby subscribing to notifications from this store. 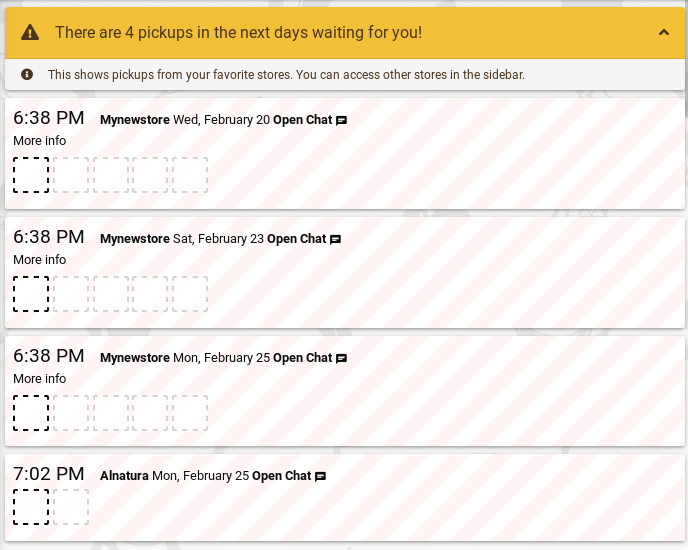 Pickup notifications on the group wall will only show pickups from favorite stores. This reduces the cognitive overload when your group has many stores and you are only interested in some of them. Also, you will only receive upcoming pickup email for stores you marked as favorite. When the new features goes online, you will by default be subscribed to the stores you picked up from in the last 3 weeks. Ok! - If you are curious how this works, you can already try it out on https://dev.karrot.world right now. Any comments on it? - I’m happy about feedback here or on the Github issue. I tested a bit and have just one (big) comment. Could the pickups and the wall be on the same page? I think pickups are more important actually and now the wall is the first thing one sees. Maybe these could be next to each other always of maybe the wall could be opened or closed from the side or something. I would prioritize the pickups as the default page. Indeed, it could be similar to the group wall, with upcoming pickups on top. But then they look quite similar, users might confuse them. Hi. It’s my first post here I’ve played a bit with new features and have the following comments / suggestions. Pickups are more important than a Wall, especially when it comes to specific stores. When a user clicks on a store at the panel on the left, in most cases he/she expects to see available pickups for a selected store. This is also what everyone is currently used to. 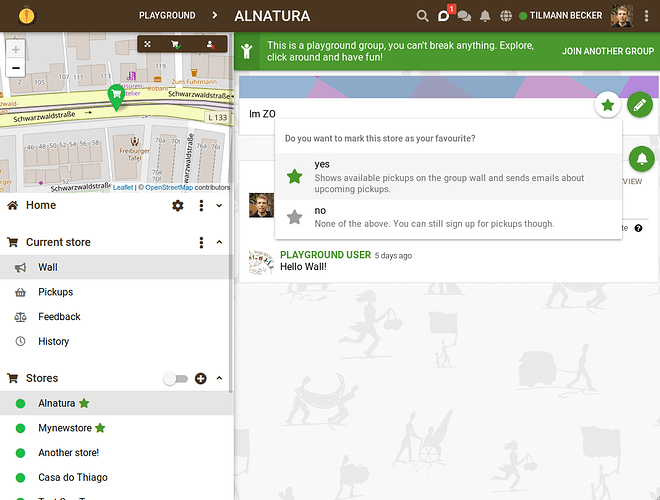 In the new set-up users will only see a wall with description of the store and some discussions. It requires extra click to get to the Pickups which is unnecessary effort and may introduce confusion. Althouth the feature to have discussions on specific stores might be handy, I suppose it won’t be used on regular basis because, in most cases, there is nothing to discuss. Therefore, I would strongly recommend to keep Pickups page as a default one when a user clicks on a store. A button to subscribe a store is only available on Wall page. Is there any reason not to have it also on Pickups page? The same applies for Edit button. The upper sections on both pages look exactly the same - they contain a description of the store but available features are different. Although I might understand the logic behind this, I personally think this introduces unnecessary complexity. My strong preference would be to have all the buttons: Subscribe, Edit, Show and Manage the Pickups, Get Directions both on Wall and Pickups page. I’ll make some adjustments to the code and push the changes to dev.karrot.world later today! After you added a new section with pickups in favourite stores, we don’t have a section with unattended pickups in all the stores any more. This section is very helpful to track which stores still need to be attended. It also might be an incentive to join an unattended pickup in a store which is not among the favourite ones. Moreover, in Poland we have a dedicated person each week who is responsible for overseeing that all the pickups in Karrot are attended. The section which shows all the unattended pickups is the best tool to check what is missing. It saves a lot of scrolling on Pickups page and helps avoid situations that some unattended pickups will be missed (especially if there are a lot of stores). To sum up, my recommendation is to keep the currently existing section which shows all the unattended pickups in all the stores below the section with pickups in favourite stores. Hopefully, it shouldn’t be difficult to add it since we have already had this section so far? 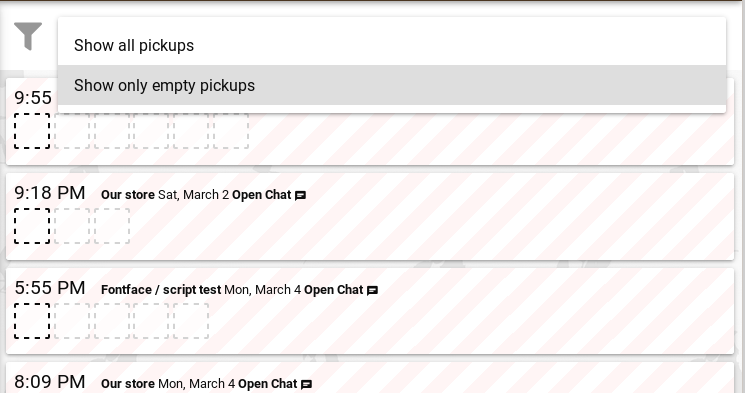 About your new proposal: the current list in Karrot shows all pickups in the next days that are not full (and the current user is not a member). 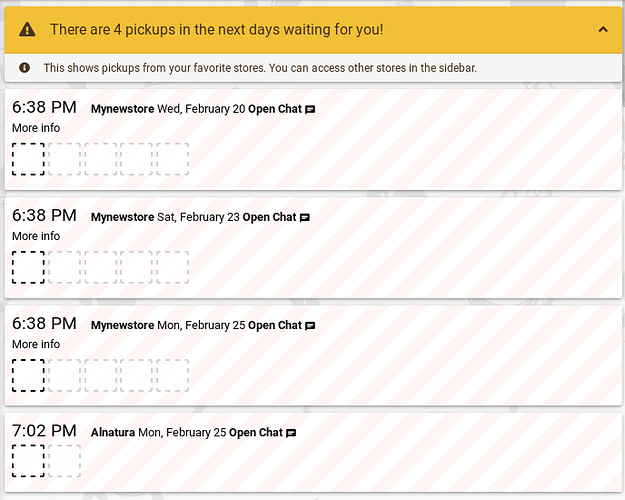 It seems to me that you actually need a list that shows all empty pickups in the next 7 days. Is that correct? What do you think about adding a filter option to the group pickup list? Hi. By unattended pickups I meant a list of pickups which are not full. I forgot that current list would not show the pickups where the current user is already a member. Actually I’m not sure which option is better though. They have different purpose. All pickups which are not full help quickly identify find pickups where we need or might need help. All pickups which are not full excluding the ones where I’m already a member show pickups which I still can join. A bit different purpose and I don’t have a strong opinion which is better. Thanks for the clarification! I published the pickup filter to dev.karrot.world, with the third option added (“show not full pickups”) and the descriptions shortened. Hi. I tested the filter. The functionality works fine and it is a very helpful feature. Thanks! If I were to be picky, I’d only recommend to make it stand out from the background a bit more, i.e. change a colour to grey or add some shaded borders to make it more visible. People are still using the main wall for posting stuff that are definitely more suited to the store wall, either because they do not know about this new feature or because they believe it’s more hidden and others won’t read their message. It’s takes a couple of steps to check if there are any messages on a store wall if you haven’t subscribed to it. You need to first click on the store, then on wall, and you will not know if there is anything new there until you reached the page. Make it visible who has subscribed to a store, so that it will be more likely for teams or communities to form around that specific store or place, and it will give some assurance of whom will be reached by your message when you write on a store wall. Add a chat icon together with others on store page (too much maybe?) or any other kind of element between the description of the store and the pickups that give access to the wall and visibility of new messages. The eyes are first drawn to that page rather than sidenav where you find the link to the store wall, don’t you agree? I definitely agree with Bruno! I think that people look for the wall somewhere on top, not left. It could be more visible and also new messages could be visible. And also who is there - so all that Bruno mentioned :-). If such top panel were available at each sub-page for each store, navigation would be much easier. I would suggest asking users for a reason. It’s still a new feature, therefore, they might not know / remember how to use it correctly. Moreover, in each case it’s worth reminding them that store-related discussions should be moved to store walls. Another input I got from a Bike Kitchen user is to make it easier to subscribe to a store/place by having the star directly next to the store/place name on the sidenav. Isn’t that already the case? It works when the user is subscribed to the conversation (“all” or “some” option) - if they are unsubscribed, we should respect their wish to not get informed about new messages.